Bariatric Protein Shakes and Supplements Just Got Delicious! 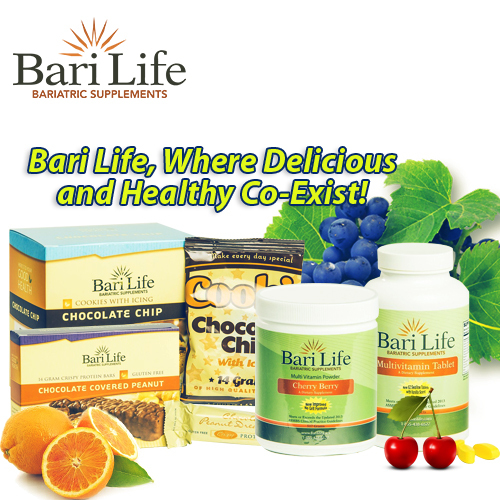 Bari Life Bariatric Protein Foods and Bariatric Vitamin Supplements are designed with your health and taste buds in mind! Having weight loss surgery doesn’t mean that you have to settle for bland! You may have thought you would have to sacrifice taste for something healthy, but with Bari Life nutritional products you can have the best of both worlds. Healthy supplements, that provide all the nutrients you need after bariatric surgery, plus delicious options to suite every taste! These delicious cookies that Santa ate over Christmas prove that high protein cookies can taste great and still work with your diet plan. Ingredients: Protein Blend (Soy Protein Isolate, Whey Protein Isolate, Milk Protein Concentrate), High Pro Confectionary Drops, Honey, Unsalted Butter, Glycerin, Brown Sugar, Water, Chocolate Coating, Corn Syrup, Eggs, Starch, Collagen, Vanilla Extracts, Oat Bran, Fibersol, Baking Soda, Salt, Potassium Sorbate, Sucralose. Chocolate coated, with a chewy and crispy texture. A truly perfect balance between chocolate and peanut flavor. For guidance on how to use these nutritional protein supplements as part of a healthy weight loss plan view our Diet Plans. Ingredients: Soy Protein Crisp (Soy Protein Isolate, Tapioca Starch, Salt), Maltitol Syrup, Chocolate Coating (Sugar, Palm Kernel Oil, Cocoa Powder, Whey Powder, Nonfat Milk Powder, Soy Lecithin, Natural Vanilla Flavor), Peanuts, Glycerine, Acacia Gum, Organic Cane Sugar, Natural Flavors, Soy Lecithin, Sea Salt, Xanthan Gum. Bariatric Bari Life Multivitamin Tablets are a custom formula for Bariatric Patients. Dr. Boyce has developed a modular formula that is easily adaptable to patient needs. It is the ONLY bariatric multivitamin on the market that meets or exceeds the clinical practice guidelines of the American Society of Metabolic and Bariatric Surgery (ASMBS) IN ONE BOTTLE! CLINICALLY PROVEN the vitamins are designed to ensure your metabolic needs are met. The tablets have a nice vanilla scent and hydrophilic coating for EZ-swallow. View the “About our Supplements” page for the ASMBS recommendation chart. There is no other multivitamin on the market that contains all of the recommended vitamin and mineral supplements in an all in one bottle formula! Simplify your vitamin regimen by trying our multivitamins today! Thank you to all our customers who truly make us strive everyday to provide the absolute best for your health and supplementation need after bariatric surgery. It is our passion and our utmost focus to make sure our products are the best on the market and truly do make your bariatric vitamin regimen simpler and more effective for your life!